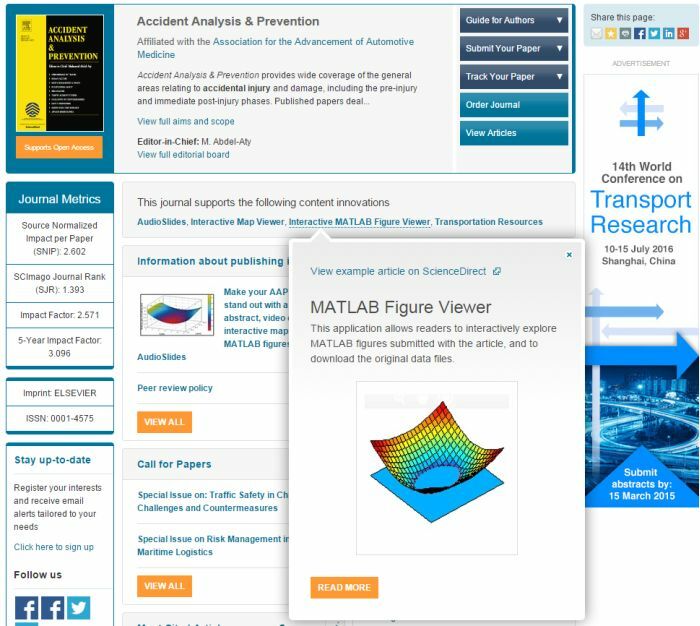 With features such as AudioSlides, Interactive Plotsand 3D models, Elsevier’s content innovation portfolio offersa range of options when it comes to enriching the content of your article. The content innovations relevant for your field aredesigned to communicate your research more effectively, increase the value ofyour article and engage readers. The content innovation portfolio hasbeen developed to ensure you can publish your work in all its dimensions,including digital content like data, code, multimedia, etc. It takes advantageof modern web technology to deliver an interactive reading experience that goesfar beyond the traditional paper or PDF. And for most content innovations, youcan choose to add them at any point of the publication process, right until the last revision round. The content innovation program builds upon the Elsevier Article ofthe Future (AoF) project, which has been focusing on improving the online articlepresentation and supporting new types of digital content as well as contextualinformation. At AoF’s core is the reading experience and the 3-pane view introduced on ScienceDirect, allowing for content-based and contextualenrichments within the article. Since2011, the content innovation program has rapidly expanded to include improvedonline presentation, better support and visualization of digital content, andcontextualization of the article by linking with data repositories and othersources of trusted scientific content on the web. In 2014, more than 10 percent of articles published inan Elsevier journal carried a content innovation. And,as with other content innovations, the process of implementing iPlots remains asimple one for authors - you need only upload a supplementary .csv file whenyou submit your article or revision. 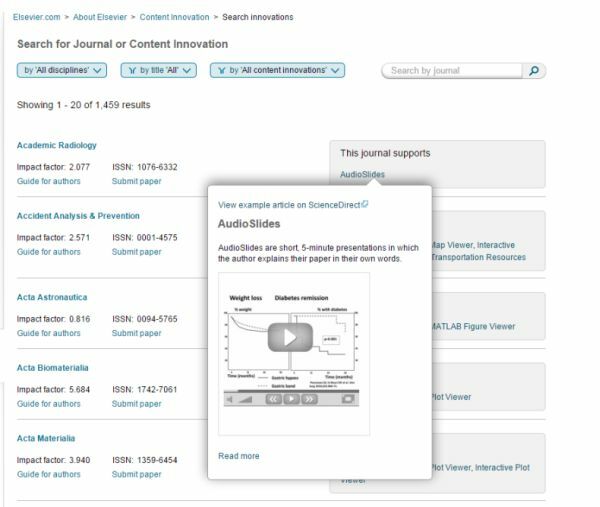 With the content innovation portfoliocontinuing to grow, the team has developed a new search and browse tool on Elsevier.com, which provides anoverview of content innovations per journal and discipline. To find out moreabout a particular content innovation, just click on the name and a boxcontaining a brief description will appear (Figure 1). The tool also contains useful links to relevant journalinformation. Contentinnovations offered by individual journals can now also be found on theirElsevier.com homepages (Figure 2). The most widely-availablecontent innovation is AudioSlides, 5-minute, webcast-style presentations in which you can present yourresearch. Once your paper has been accepted by aparticipating journal, you will receive a personal invitation to access the AudioSlidestool, where you can easily upload slides and record a voice over. The resultingpresentations will be hosted next to your article on ScienceDirect. The reader also gets a quick grasp about the paper thatcannot be explained in a short written abstract.” TilbeGöksun, Assistant Professor of Psychology at Koç University, Istanbul, oncreating her AudioSlides. The Interactive Map Viewer is another widely available feature, whichenables authors to include geographic annotations on interactive maps (Figure3). These maps, which appear on ScienceDirect, are based on KML(Keyhole Markup Language) files. This annotation could be a simple landmarkpointer with a textual note, but also a visual overlay with actual researchdata. To see how your Google Maps KML/KMZ files will appear on ScienceDirect,you can use an onlinevalidation tool before submitting it with your article. In my research, I work a lot with geospatial data that Imanage with geographical information tools. Uploading the KML files with mymanuscript is less work than having to create images for all the data that Iwish to present with my paper.” DanielPastor Galan, PhD, postdoctoral fellow at Utrecht University on the Interactive Map Viewer. The Virtual Microscope is the proudrecipient of the 2015 Prose Award for best neweProduct/App. Authors of selected Elsevier journals areinvited to complement conventional (low-res) microscopic images in their paperswith high resolution equivalents for use with the Virtual Microscope. Oncepublications containing the high resolution images are online, users are thenable to view these using a standard browser and can zoom, pan and rotate theimages. For the first time we cansupport our publications with high resolution whole slide scans – this is a game changer." MarkLingen, DDS, PhD, Editor-in-Chief of the journal Oral Surgery, Oral Medicine, Oral Pathology and OralRadiology, on the VirtualMicroscope. Visit our content innovation homepage or new search and browse tool for a full list of options. Kitty van Hensbergen is a Project Manager in the MarketingCommunications & Researcher Engagement department and is responsible forglobal projects. She has an MSc degree in economics and business, specializingin marketing, from Erasmus UniversityRotterdam. She is based in Amsterdam.